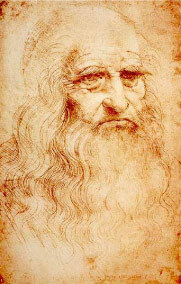 Leonardo da Vinci was born on April 15, 1452 in Vinci, Italy. He was born to Piero da Vinci, a notary, and Caterina, a peasant woman. Leonardo grew up in his father's home, and was exposed to Vinci's painting traditions. When he was 15 years old he became an apprentice at the renowned workshop of Andrea del Verrochio in Florence. Even as an apprentice Leonardo demonstrated incredible artistic talent. Leonardo spent many of his young adult years working for Ludovico il Moro in Milan. He later found work in Rome, Bologna and Venice. He spent his last years in France. Because Leonardo's interests were so varied, he was easily distracted and had trouble completing projects. During the 17 years he spent working for the Duke of Milan (1482-1499) he completed only six works, including The Last Supper and The Virgin on the Rocks. Dozens of paintings and projects were never completed. Da Vinci has come to be regarded as one of the greatest painters of all time, and quite possibily the most talented person that has ever lived. Helen Gardner remarked that "the scope and depth of his interests were without precedent... His mind and personality seem to us superhuman, the man himself mysterious and remote." Throughout his life his interests led him to develop many talents and become many things including a mathematician, inventor, engineer, scientist, anatomist, painter, sculptor, botanist, architect, musician and writer. He has been described as a renaissance man "whose unquenchable curiosity was equaled only by his powers of invention." Leonardo da Vinci died on May 2, 1519 in Amboise, Touraine which is today Indre-et-Loire, France. The Last Supper and Mona Lisa are among his greatest artistic acheivements. 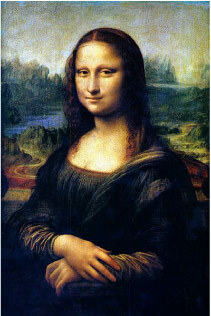 The Mona Lisa is among the most recognizable artworks in the world. 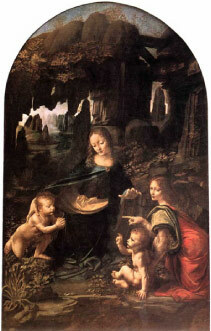 The Virgin on the Rocks is an image of the Madonna, with the baby Jesus on the right, and John and the angel Uriel on the left. It was quite common at the time this painting was created to include golden, yellow or white rings around the heads of people written about in the Bible. The Last Supper is one of Leonardo's most famous paintings. The work represents the last meal that Jesus shared with his disciples before his capture and crucifiction. Mona Lisa is a painting of Lisa del Giocondo, the wife of Italian silk merchant Francesco del Giocondo. The couple commissioned the painting to hang in their new home, and to celebrate the birth of Andrea, their second son.